You'll be £19.99 closer to your next £10.00 credit when you purchase Naval Policy Between the Wars. What's this? First published in 1968 and 1976, the two volumes of this work still constitute the only authoritative study of the broad geo-political, economic and strategic factors behind the inter-war development of the Royal Navy and, to a great extent, that of its principal rival, the United States Navy. Roskill conceived the work as a peacetime equivalent of the official naval histories, filling the gap between the First World War volumes and his own study of the Navy in the Second. As such it is marked by the extensive use of British and American sources, from which Roskill extracted shrewd and balanced conclusions that have stood the test of time.rnrnThe main themes of the first volume are: the after-effects of the Armistice; the struggle to prevent a renewed naval arms race, despite the challenge from the USA and Japan, which culminated in the Washington Naval Treaty; and the broader attempts at peace-keeping through diplomacy and the fragile vehicle of the League of Nations. On a technical level, the primacy of big-gun battleships was increasingly challenged by air power, and the Navy fought an internal battle with the Air Force to obtain sufficient aviation assets for the fleet. Although the 1920s is largely ignored in naval history, this volume demonstrates that the period is key to understanding the development of the Navy that fought the Second World War. This outstanding two-volume study was built around extensive use of material from British and American sources and there is no doubt that Roskill’s shrewd and balanced conclusions have stood the test of time. Highly recommended. There are many pages of interesting illustrations. Footnotes make supporting detail much more accessible to the reader who does not have to keep swapping from the page they are reading to an annex at the back of the book. A reissue of this seminal work is long overdue and Seaforth publishing are to be congratulated for producing this excellent new edition for a very reasonable price. 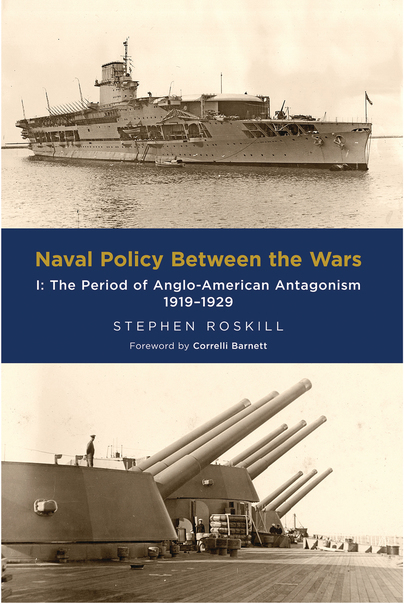 Si vis pacem, para bellum ..
Captain Stephen Roskill is one of the foremost twentieth century naval historians. This is a welcome Seaforth reprint of the two volumes (1919-1929 and 1930-1939) which emerged originally in 1968 and 1976. It includes a foreword by Corelli Barnett, also a name to conjure with. Post-1918 the immediate business was the Peace settlement, which promptly brought the erstwhile Allies into rivalry. Political, strategic and economic interests fought against each other throughout the period, against an RN background of retrenchment, demobilisation and arguments about pay and redundancies; want of understanding of Air on the part of the RN and many of our senior admirals – standfast Oliver, the rising Chatfield, WW Fisher (sound on Air but not on Convoy), Henderson, James, and (snubbed and sidelined for being too bright) Richmond and Godfrey - operating beyond their intellectual competence; the divergent objectives of the Allies, including US ambitions (these salted with no little Anglophobic paranoia); the - as it turned out rather convenient – treacherous scuttling of the German ships at Scapa; French chauvinistic duplicity; and events (described) such as our shambolic interventions in Turkey and Russia and associated mission creep, where, nevertheless, the RN saved the nascent Baltic republics from oblivion. The same factors, plus the misguided machinations of the League of Nations, bear-led by fatuous pacifistic idealism, affected the Disarmament negotiations (the core of the work) as our politicians chased moonbeams with tail-chasing semantics in Washington, Geneva and London to the detriment of the RN. These negotiations soaked up enormous amounts of staffwork diverted from the care of the Fleet. The Admiralty can be seen successively at war at home with Trenchard, with his myopic false doctrine of Unified Air; the mercurial, opportunistic, capricious and self-serving Churchill; the Labour governments and the Left generally; and others. Unscientific over-confidence in AA gunnery and Asdic undermined the Admiralty's advocacy. Government stonewalling on new construction perhaps meant that what was eventually built in the late 1930s Rearmament gave us a more modern core to the Fleet for WW2 than trickle shipbuilding would have done; but for the main part of the period the RN was rubbing along on Old Ming. The tribulations of the RN trying to rearm at the rush after two decades of near-stagnation, up to the last minute opposed by those who thought war could be wished away and those wilfully in by Hitler's blatant lies, bring the narration to a close. The arbitrary destruction of naval aviation on All Fools' Day 1918 hangs like a dark cloud over the entire period. Six of the 31 chapters in the two volumes taken together are about this. As the story matures we can see the USN steadily progressing to a supremacy in air warfare at sea that it has never lost, and which was to prove itself in the Pacific in WW2, while the RN was saddled with inadequate and obsolescent aircraft, operating too often under myopic senior officers who didn't understand maritime Air. The only successful aircraft to reach the Fleet between the wars (the Swordfish) was a manufacturer's private venture. As to the Fleet, Roskill relates how its exercises reflected a fixation with fleet-on-fleet engagement, how the inadequacy of the Fleet Air Arm often prevented proper understanding of the capabilities and usefulness of aircraft, and how, whatever the expenditure of oil and ammunition, almost nothing prepared the RN for the realities of the war that was to come although there was some useful experiment in amphibious warfare. To often (remembering Scott's unfortunate pre-war words) paintwork (or even polo) and smart formation manoeuvring delivered more credit to Captains than gunnery. 'Main Fleet to Singapore' did get explored but the underlying reality was the impossibility – later proven – of providing such if the RN were also engaged at home. Roskill is as concerned with personnel issues as those relating to materiel; a tenth of the second volume is devoted to the Invergordon Mutiny and a number of misconceptions and misrepresentations are corrected; the struggle for a fairer naval pay settlement is pursued to its end. Roll on the Nelson, the Rodney, Renown .. the first two joined the Fleet in 1925, armour and speed sacrificed to meet treaty requirements. The second volume of this work takes us forward to the more active 1930s, the rise of the German threat and an RN stretched by the Spanish civil war and Mussolini's aggression in Abyssinia. The need for rearmament broke the dam and brought us the KGV battleships and modern aircraft carriers and more, smaller cruisers. Roskill's extraordinary wide and deep research, meticulously sourced, is complemented by careful analysis, often informed by his own worm's eye view as he rose from 1917 cadet to Commander in 1938. He picks his way forensically between often partisan and self-serving accounts of events to drill down into the realities. Throughout we are given illuminating pen portraits of the political and naval people involved and the organisation behind them. USN ambitions and development are tracked alongside those of the RN as is the steady increase in Japanese naval and naval air strength. Apparently disparate threads are most skilfully woven into a coherent fabric. Every now and again some brilliant gem emerges such as Jellicoe's extraordinarily prescient and detailed 1919 forecast of exactly how Japan would attack in the East, or exact detail of how Germany deliberately ignored the Versailles Treaty as regards disarmament, particularly in respect of the ban on submarines, long before the Nazis took over; or vignettes such as Jack running a 6” gun-armed train in the depths of Siberia. Footnotes make supporting detail much more accessible to the reader who does not have to keep swapping from the read page to an annex at the back of the book. The illustrations are pertinent and interesting. Seaforth are to be congratulated on, via this reprint, bringing this important analysis again to notice. Its current relevance is that today's debates about our Navy quite uncannily reflect many of the same issues, arguments and misunderstandings as those of a century ago. 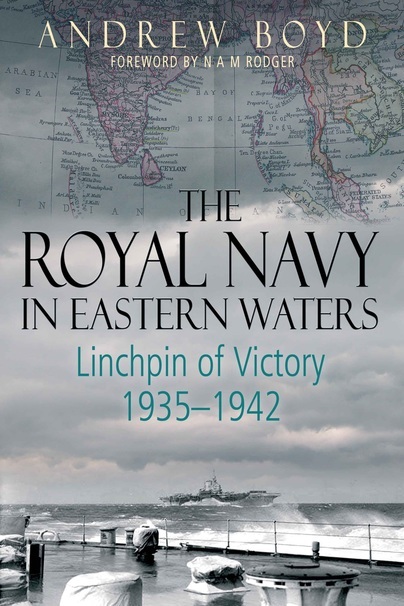 This work fills the gap between with Marder on WW1 and Roskill's own history of the War at Sea in WW2 and so completes a comprehensive account of half a century of the Royal Navy as it rose and fell from Dreadnought to Vanguard. STEPHEN ROSKILL a retired RN captain, was the author of the official history of the Second World War at sea. He later wrote a number of highly regarded books, including a biography of Admiral Beatty and a study of Churchill and the admirals.